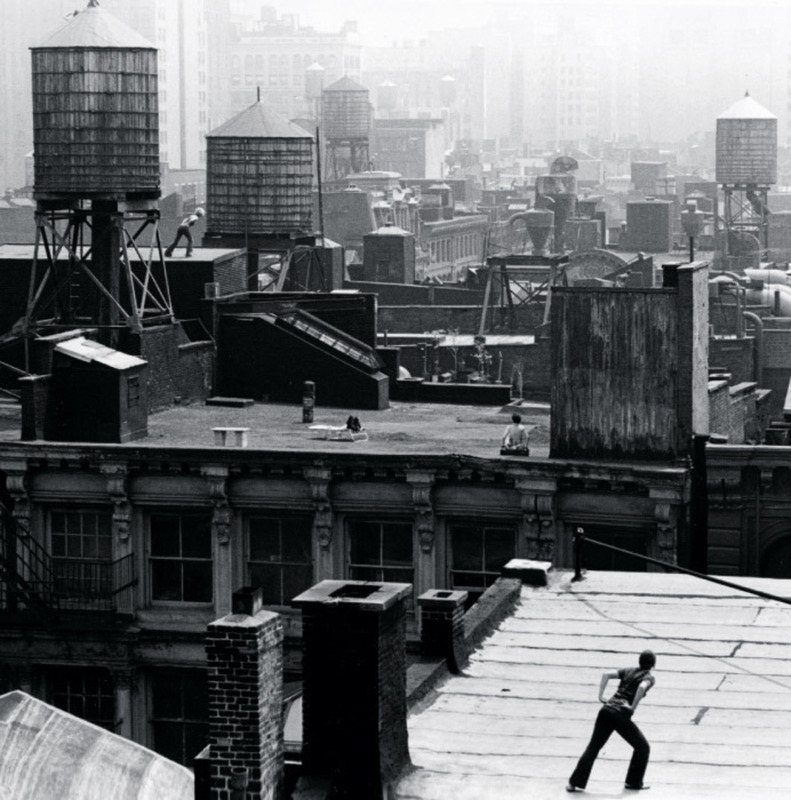 Trisha Brown performing Roof Piece, New York, 1971. Photo: Babette Mangolte. ON THE FORTIETH ANNIVERSARY of the Summer of Love, the Lincoln Center Out of Doors festival celebrated the “spirit of the ’60s” with a series of concerts by musicians Dave Brubeck, Arlo Guthrie, and Pauline Oliveros and performances by choreographers Trisha Brown and Paul Taylor. The Trisha Brown Dance Company’s evening ended on a poignant note with a performance of PRESENT TENSE, 2003, whose set and costumes were designed by Elizabeth Murray. Murray had died on August 12, 2007, just two days before the performanceso seeing her immediately recognizable painted forms behind dancers so vibrantly alive brought tears to the eyes. It wasn’t the only moment of sadness. Also on the program was Canto/Pianto, 1997–98, a suite of dances from Brown’s extraordinary production of Monteverdi’s L’Orfeo. The mood of those dances progresses, like the Orpheus myth itself, from joyous to mournful. A sorrowful note had already been sounded momentarily, for me, in the program opener, Accumulation, 1971. For this hallmark work, Brown invented a wholly new lexicon of ordinary movement performed with effortless directnesstwists of the wrist and torso, turns of the head, shifts of body weight, lifts of the leg, steps backward and forward, swings of the armsand you see that lexicon with absolute clarity through Accumulation’s simple additive structure: A gesture is performed and repeated several times; a second gesture is added to it, and these are repeated; another is added; and so on. I have watched Brown perform the dance many timesto the Grateful Dead’s “Uncle John’s Band”; while talking; interwoven with Watermotor, 1978; telling two different storiesA, Bplus Watermotor. Whether seeing it at its simplest or at its most complex and demanding (for the performer, that is; the audience experiences the prodigious mnemonic feat simply as a dance), I always marveled at its conceptual economy and beauty. But the performance of Accumulation I saw at Lincoln Center Out of Doors was unlike any I’d seen before: Brown wasn’t doing it; a member of her company was. Of course, Accumulation’s series of distinctive phrases, not technically especially difficult, is eminently teachable. But never having seen the work danced by anyone but Brown, I guess I thought I never would. Accumulation’s movement seemed to emanate straight from her person. More than that, I’d watched Brown continue to dance so well over the years, into her middle age and beyond: Beginning in 1994, year after year, with her back to audience and looking upstage, she danced, wonderfully, If You Couldn’t See Me, the solo that Robert Rauschenberg “invented” for her. So I wasn’t prepared to see anyone but Brown dance any of her signature solos. It stopped me short, saddened meand then my sadness was dissipated by Sandra Grinberg’s fine performance. In the intervening three and a half years, as Brown has devoted herself to restaging many of her early works, I’ve grown accustomed to seeing her former roles taken by other members of her company. At the same time, a younger generation of viewers has had the opportunity to see for themselves the relevance of Brown’s radical reinvention of dance to the current vogue for performance in art institutions, beginning with the inclusion of Floor of the Forest, 1970, and Accumulation in Documenta 12. Together with her Judson Dance Theater peers (and under the influence of Minimal and Conceptual art), Brown originated ordinary movement and talking as dance, site-situated dance, and dance structured by the following of simple rules. As these gave rise to what we now know as performance art, Brown moved unexpectedly to the supple improvisatory choreography that her company now dances with such virtuosity but that, scaled down, can also be taught to opera singers working alongside her dancers. The past year’s fortieth anniversary of the Trisha Brown Dance Company has occasioned a great profusion of performances of Brown’s dances, both old and new.¹ The high points, for me, have been the early work incorporating film, Planes, 1968; the legendary equipment pieces Man Walking Down the Side of a Building, 1970, Walking on the Wall, 1971, and Spiral, 1974; Brown’s first proscenium piece, Glacial Decoy, 1979; and, most of all, the unannounced work that Brown danced with four of the women in her company at Dia:Beacon on May 1. When I arrived at the museum that day, Steven Evans, then managing director of Dia:Beacon, whispered conspiratorially, “Be sure to stay for the second performance, because Trisha might dance.” It was moving to see her dancing again, but more moving still to see the intimacy between her and the women in her company concretized. Compressed within the relatively brief improvisatory dance, it seemed, were the entire forty years of Brown’s working with, teaching, learning from, supporting, and depending on generations of women dancers. “Trisha, what are you going to do with those two men?” Yvonne Rainer asked in a 1979 interview with Brown about Glacial Decoy.² (Brown had just begun to admit men into her company, although Glacial Decoy was still danced exclusively by women.) Brown’s reply: “I’m going to dance with them.” Indeed, she did; and, no doubt, adding men to the company changed the kinds of dances Brown went on to make. But you can understand Rainer’s question, and you could see again what occasioned itin the qualities of trust and touch, of genuine accord, of each dancer’s differentiation of Brown’s movement stylein what Brown and Elena Demyanenko, Leah Morrison, Tamara Riewe, and Laurel Tentindo did that afternoon, as Brown performed duets with each dancer in turn while others improvised solos that reflected the movement of that central pair. Trisha Brown, Spiral, 1974. Performance view, Dia:Beacon, Beacon, NY, February 12, 2010. Nicholas Strafaccia. Photo: Stephanie Berger. IN FEBRUARY, I had already stayed through both the 1 and 3 PM performances of Brown’s works at Dia:Beacon, because I had no intention of missing the opportunity to see Spiral done a second time, so quickly did it go by the first time around. To perform Spiral, each dancer climbs a ladder and attaches her- or himself to a harness, which is in turn attached to a cord that circles around the column from top to bottom. Once the dancers are in place and the signal is given, assistants pull the ladders out of the way and the dance commences. The dancers use the tension of a connective cord to achieve a perpendicular orientation and thus to walk down and around the column. The forest of columns in Dia’s enormous lower-level galleries seemed made for this work (originally performed in a SoHo gallery space with a row of four columns down the center). All ten of Brown’s dancers could spiral around and down a single line of columns simultaneously at Dia, making for a breathtaking sight. Done twice in each cycle of dances at Beaconfirst in flawless unison, then in canoneach performance whizzed by in just a few seconds. Spiral shares something of the excitement of a daredevil stunt, yet it couldn’t be more different. One of the stories that circulates about Brown’s beginnings has it that, while improvising with a push broom on Anna Halprin’s Marin County outdoor dance deck in 1960, she thrust the broom in front of her so hard that she propelled herself right into the air horizontally, a willed self-propulsion that turned into a moment of flight. The legend of Brown defying the force of gravity continued with her “levitation”what she called “lying down in the air”while dancing Trillium at a Judson Dance Theater concert in 1962. (I didn’t witness either of these wondrous events, but those who didSimone Forti, Rainerare trustworthy sources.) But Brown’s overcoming of gravity in the equipment pieces has nothing of the quality of miracles, since the equipment that makes the “walking on walls” possible is so fully visible in these works. In Spiral, for example, no part of the apparatus that gives the dancers the ability to walk parallel to the ground is hidden. What is hidden from the spectator is the strength of the body’s core that allows the dancers to stay perpendicular to the columns and walk down and around them at an even, determined pace. We see both gravity’s force and its defiance. It is, after all, that force that propels the dancers so quickly and thrillingly in their downward spirals until all ten of them are lying on the ground, feet still on the columns. But the image of Brown “lying down in the air” returnedand persists to this dayafter she stopped using equipment. Watermotor, the dance she made before Glacial Decoy and one that once again initiated a new language of dance movement, makes it believable in ways that the equipment pieces had not. Lasting only two and a half minutes, Watermotor is, whether in spite or because of its brevity, a masterpiece. (Or is that a word that the dance contradicts?) Will it ever be danceable by anyone but Brown? If noteven if sothere is the consolation of Babette Mangolte’s film of Brown dancing it the year it was made. Because she seems to dart in two directions at once, spring into the air with no preparation, and keep every part of her body in continuous motion, you can believe Brown would be capable of miracles. Mangolte must have felt this sense of awe, because she filmed the dance twice, the second time slowing it down to forty-eight frames per second. The slow motion allows us to apprehend details of the movement we see only subliminally in real time, but it also exaggerates the dance’s luscious fluidity so that it looks like it’s happening underwater. MANGOLTE’S FULL UNDERSTANDING of this brand-new dance in 1978 and her ability to translate that understanding to film with such success became all the more obvious to me when I saw Jonathan Demme’s film Trisha Brown’s Accumulation with Talking plus Watermotor, 1986. The contrast with Mangolte’s film is instructive. Like too many filmmakers, Demme apparently doesn’t trust dance’s capacity to create its own story. As a result, he provides a narrative frame for the dance, setting it in Brown’s studio and having members of the company arrive throughout and sit down to watch Brown dance. The opening shot is a close-up of Brown’s feet, accompanied by the sound of her off-camera voice: “Start . . . starting . . . starting to talk while doing this dance.” Demme cuts to a close-up of Brown’s arms on the opening gestures of Accumulation and holds the close-up as Brown herself cuts to the first moves of Watermotor. A close-up of a company member opening the door to let herself in is followed by a POV long shot, then a cut back to a close-up on Brown. The splicing of shots and angles through which Demme constructs the dance film is superimposed on the dance’s own splicing device. Brown borrowed filmic montage to interrupt one dance with another and story A with story B, like the crosscutting between present and flashback in a movie. Babette Mangolte, Watermotor, 1978. Still from a film in 35 mm, 7 minutes 32 seconds. 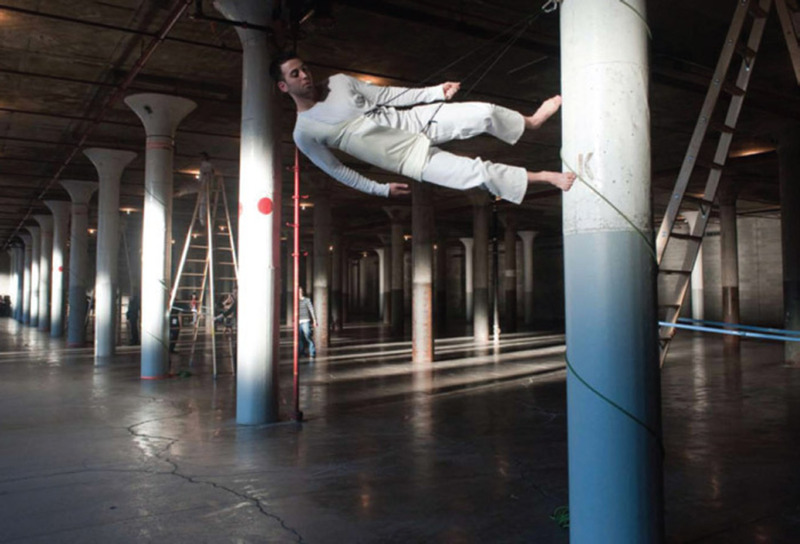 Performed and choreographed by Trisha Brown. Brown made explicit her interest in film’s capabilities in her dance For M. G.: The Movie, 1991, which will be revived at Dance Theater Workshop in New York in March.³ “The movie part of it,” Brown told Rainer, “has to do with making a figure materialize in the space the way you can when you edit a film. You can go from a fork to a face with a blink of the eye, to quote you [i.e., Rainer].”⁴ It is interesting, given that the dance referenced film and was called a “movie,” that Brown also made a film of itactually a videoShot Backstage, 1998. Brown’s video begins with For M. G.: The Movie already in progress. We hear a few seconds of Alvin Curran’s music, then see a close-up of two dancers, one male, one female, standing perfectly still. The woman is slightly farther from the camera than the man and is partially hidden by a wing curtain. Right away we see another woman running through the space behind the pair in close-up, and Brown dissolves to a medium shot that follows this dancer as she runs forward and backward in wide arcs across the stage. Spotlights shine straight at the camera from the opposite side of the stage. In close-up again, Brown moves her camera slowly left, past the wing curtain that half-obscured the standing woman. What we’d already gleaned is now made explicit: We’re watching the dance from the wings. What is not yet clearand for me wouldn’t become clear until the dancers took their curtain calls at the end of the filmis whether we are watching from stage left or stage right. This undecidability is partly the effect of the standing dancers (who we eventually learn are facing upstage); the male dancer will remain there, standing still, throughout the entire dance. For a long time the running woman constitutes the only movement. She seems to trace a series of different paths around, across, and along the borders of the stage. Occasionally she hops or swoops or stops; often she changes direction and runs backward, but though the camera follows her as best it can, you cannot make out the pattern of her trajectory, so persistently does the camera’s location backstage cut it off from a comprehensive view. About halfway through For M. G.: The Movie, the running dancer returns to the stage. In direct contradiction of Brown’s intention for the dance itself to be like a movieinsofar as dancers suddenly appear onstage without our noticing how they got therewe watch this performer in the wings, flexing her feet, preparing to go onstage, then taking off on her run. She seems to repeat the patterns with which the dance began, but this time she shares the stage not only with the motionless man but briefly with the couple dancing the duet we’ve been watching and with a dancer lying down, who will eventually roll away from the camera and off the stage. Occasionally the camera moves past a dancer to focus on nothing much at allthe side of the stage, a wing curtain; at other times it focuses on things in the dance that the audience could never see the way Brown’s camera sees them, like a tight close-up of a woman very tenderly placing her hand on the chest of the stationary male dancer. The cut from her hand moving slowly away from him to the face of another dancer is confusing at first. It looks like it should be the same dancer, but it’s not. The first has long hair pulled back, the second close-cropped hair. The second dances the solo that Brown would be dancing were she not behind the camera, although calling it a solo might seem imprecise, since there is another dancer onstage dancing along with her, occasionally even in unison. 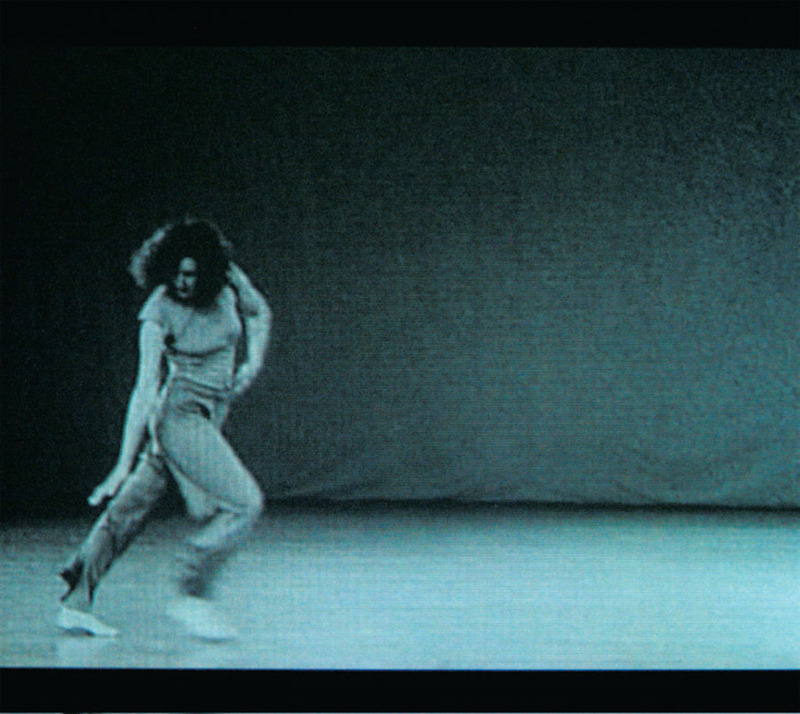 Trisha Brown, Shot Backstage, 1998, stills from a black-and-white 8 mm video, 31 minutes 40 seconds. The solofor indeed it is one, and one of Brown’s great onesis full of Brown’s characteristic odd gestural movements, things she does with the hands and arms that are utterly distinctive, things that seem to be representational but aren’t, or at least aren’t in ways we can read. (Brown has made it clear that her improvisational means of inventing movement involves gestures that have private meanings that aren’t intended to be legible to an audience.) The solo is also full of her characteristic combinations of walking, hopping, skipping, bounding, leaping, falling, crouching, crawling, and lying down; extending, balancing, folding, shifting, twisting, and changing directions. The movements seem to come from the extremities one moment, the core another, the joints anotherall done with unexpected shifts in velocity, from glacial slowness to lightning speed to stock-stillness. There’s a one-leg balance that is held as long as anything in early Merce Cunningham. The dance ends with this solo, although in its final moment it again becomes a duet danced in perfect unison. Brown was one of the first choreographers to incorporate film into dance, famously dancing in sync with Robert Whitman’s film of her performing the same dance, as the film was projected onto the walls of the performance space from a 16-mm projector strapped to her back (Homemade, 1966); and using aerial footage by Jud Yalkut projected onto three wall-climbing dancers in Planes. But Brown’s making a film was unexpected. We’d known from the Walker Art Center’s exhibition of her drawings in Minneapolis in 2008, and from another at Sikkema Jenkins & Co. in New York in 2009, that Brown is an accomplished draftsman. And perhaps the drawings provide a clue to why Shot Backstage is so successful. Brown’s early structured pieces, most notably Locus, 1975, led her to make diagrams to map out their ordered movements. Giving herself a set of strict rules within which to choreograph, she eventually came to apply structuring devices to the drawings themselves, now freed from their relationship to any particular dance. This method also seems to apply to Shot Backstage. The rule in this case is a simple one: Film the entire dance from the wings stage left. Not only will this give the viewer a new perspective on the dancethe choreographer’s or dancer’s or crew member’s perspectivebut it will also obviate the illusory transcendent or synthetic viewpoint that filmmakers so often impose on dance. (BBC dance-film maker Ross MacGibbon claimed that filming a ballet would require at least eight cameras placed throughout the auditorium in order to show a dance ideally.⁵) It’s hardly surprising that Brown would repudiate idealism; she does so here with the same conceptual rigor and improvisational flair that she brings to her dances. The structural limitation of the spectator’s viewpoint in Shot Backstage reminds me of a work by Brown that I know only from Mangolte’s well-known photograph of it: Roof Piece, performed on loft-building rooftops over a half-mile stretch in SoHo and NoHo in 1971 (and set to be re-created in the vicinity of the High Line in Chelsea and the meatpacking district in June). As Brown’s improvised movements were relayed from one dancer to the next, down the line and back again, as in a nonverbal game of telephone, there was no single vantage point from which anyone could see the whole event, including, of course, the dancers themselves. Indeed, it was the inability of performers along the route to see the original version of the moves transmitted to them that produced the work’s intended devolution, and the place from which a spectator watched determined what version of the inevitably changing movement she saw. For most of us, that version will necessarily be Mangolte’s photograph. The pointor at least one pointis that there is no right way to perform the movement, or, better, that the right way is the way it’s performed. Trisha Brown, If You Couldn’t See Me, 1994. Performance view, Baryshnikov Arts Center, New York, April 7, 2010. Leah Morrison. Photo: Julieta Cervantes. This is not to say that Brown’s choreography isn’t exacting in what it requires of her dancers, but rather that, like the sweat patterns dyed into their costumes in For M. G: The Movie, the dancers’ individuality both shows itself and finally blends perfectly with that of the other dancers. That seemed to me the very essence of the improvisatory dance Brown performed with her four company members at Dia:Beacon last May. It is also the ineffable quality in the experience of dance, and one that no film can fully reproducenor perhaps should it aspire to. Douglas Crimp is Fanny Knapp Allen Professor of art history at the University of Rochester. 1. In New York State alone, thanks to the Brooklyn Academy of Music (in the spring of 2009), the Baryshnikov Arts Center, Dia:Beacon, and the Whitney Museum of American Art, there were reconstructions of the legendary equipment pieces Man Walking Down the Side of a Building, 1970, and Walking on the Wall, 1971, together with Floor of the Forest, 1970, Leaning Duets I, 1970, and II, 1971, and Spiral, 1974; the mathematical pieces Accumulation, Group Primary Accumulation, 1970, Group Primary Accumulation with Movers, 1973, Spanish Dance, 1973, Sticks, 1973, Figure 8, 1974, Locus, 1975, and Line Up, 1976; Brown’s first proscenium piece, Glacial Decoy, 1979; and her collaboration with Fujiko Nakaya, Opal Loop: Cloud Installation #72503, 1980. In addition, there were four works from the 1960s, La Chanteuse, 1963, Planes, 1968, Falling Duets, 1968, and Skymap, 1969; the 1990s works Foray Forêt, 1990, and You Can See Us, 1995; and finally L’Amour au theater, 2009, dance selections from Brown’s production of Jean-Philipe Rameau’s opera Hippolyte et Aricie. 2. Trisha Brown and Yvonne Rainer, “A Conversation About Glacial Decoy,” October 10 (Autumn 1979): 37. 3. “M. G.” stands for Michel Guy, who was France’s minister of culture in the first administration of Jacques Chirac and was the founding director of the Festival d’Automne in 1972. He was a supporter of Brown’s work and the commissioner of this work. 4. Yvonne Rainer, “Trisha Brown,” Bomb 45 (Fall 1993): 31. 5. Brendan McCarthy, “The BBC at the Ballet: Don Quixote, Royal Ballet,” Ballet.co. Magazine, December 2001.